Me in Maine | Flickr - Photo Sharing! Self portrait in shadow on the rocks at Bass Head, Mt. Desert Island, Maine. sacredlotus, Ran Z, and 1 other people added this photo to their favorites. How's Maine, Should I drive up there some day soon? 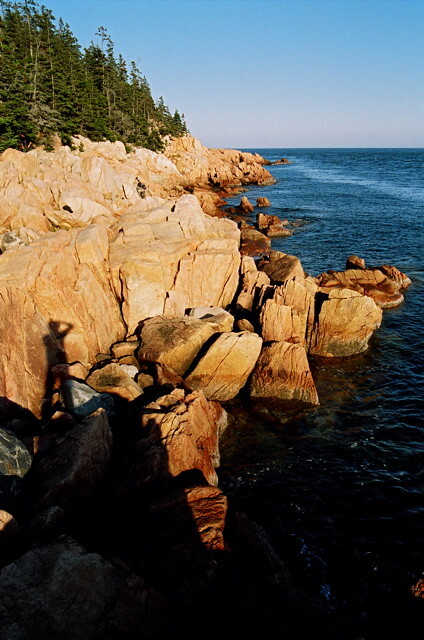 Maine's really great -- you should definitely go. It was my first trip a few weeks ago (the dates on Flickr are all wrong because it's scanned film), and I'm dying to go back. I didn't really see more than Mt. Desert Island & Acadia National Park, but that alone was worth more than the week I gave it. Well, ain't that purty! Brings back memories of my honeymoon. Yay for honeymoons! Thanks, Susan! I love the way u been added!